Vancouver Fine Art Atelier: East Side Culture Crawl 2013. East Side Culture Crawl 2013. Come to check out our new studio space and see more artists in their studios! Vancouver Fine Art Atelier found new home in the beautiful shared studio space at 1177 Parker Street, also known as Mergatroid Building. Our friendly neighbours taking part in the art festival on November 15, 16 and 17th. Please, come to see the class space and meet them, as well as other 55 artists in that location. There will be brochures with our classes information available. 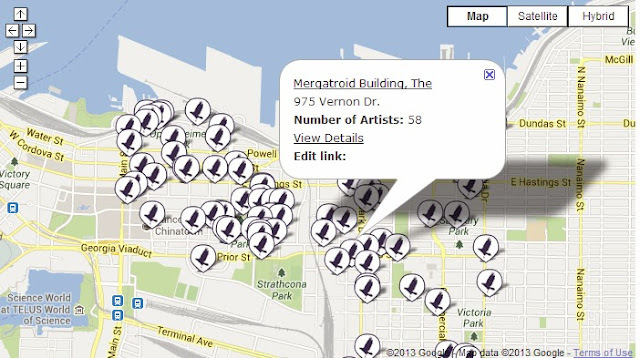 The Eastside Culture Crawl is an annual 3-day visual arts festival in November, that involves artists on Vancouver's Eastside opening their studio to the public. The event is focused on the area bounded by Main St., 1st Ave., Victoria Drive, and the Waterfront and involves painters, jewelers, sculptors, furniture makers, weavers, potters, printmakers, photographers, glassblowers; from emerging artists to those internationally established.